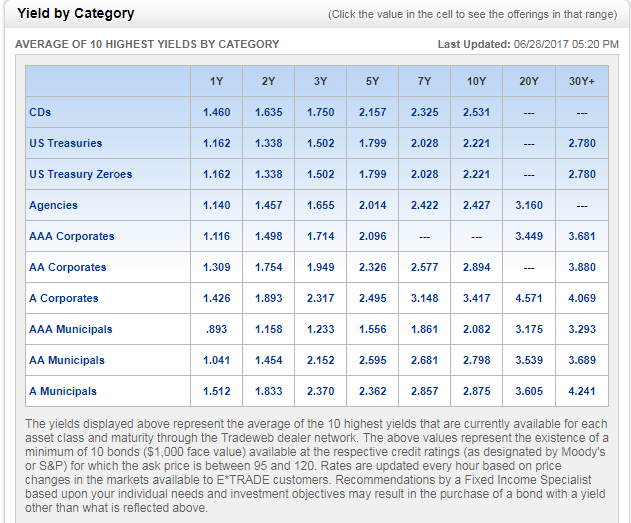 This is a screenshot from the top-level bond table on etrade.com, and I am having a hard time understanding it. I understand how bonds work, and what maturity/coupon/yield/etc are, but I'm not sure how to read the numbers here, because they don't make sense as percentages or as multipliers. For instance, take the category CDs for 1Y-- the top-left cell. It can't be that the yield is 1.46x initial investment, that wouldn't make sense or nobody would really buy anything else. But it also can't be 1.46%, because that would imply that a 30Y US Treasury bond only yields 2.78%, which is nonsensically low. I know I'm getting something wrong here, but I don't know what it is. What do these numbers mean? that would imply that a 30Y US Treasury bond only yields 2.78%, which is nonsensically low. Those are annualized yields. It would be more precise to say that "a 30Y US Treasury bond yields 2.78% per year (annualized) over 30 years", but that terminology is implied in bond markets. So if you invest $1,000 in a 30-year T-bond, you will earn roughly 2.78% in interest per year. Also note that yield is calculated as if it compounded, meaning that investing in a 30-year T-bond will give you a return that is equivalent to putting it in a savings account that earns 1.39% interest (half of 2.78%) every 6 months and compounds, meaning you earn interest on top of interest. The trade-off for these low yields is you have virtually no default risk. Unlike a company that could go bankrupt and not pay back the bond, the US Government is virtually certain to pay off these bonds because it can print or borrow more money to pay off the debts. In addition, bonds in general (and especially treasuries) have very low market risk, meaning that their value fluctuates much less that equities, even indicies. S&P 500 indices may move anywhere between -40% and 50% in any given year, while T-bonds' range of movement is much lower, between -10% and 30% historically). Yes those are really yields. A large portion of the world has negative yielding bonds in fact. This process has been in motion for the past 10 years for very specific reasons. So congratulations on discovering the bond market. But it also can't be 1.46%, because that would imply that a 30Y US Treasury bond only yields 2.78%, which is nonsensically low. The rates are displayed as of Today. As the footnote suggests these are to be read with Maturities. A Treasury with 1 year Maturity is at 1.162% and a Treasury with 30Y Maturity is at 2.78%. Generally Bonds with longer maturity terms give better yields than bonds of shorter duration. This indicates the belief that in long term the outlook is positive. It's worth pointing out that a bulk of the bond market is institutional investors (read: large corporations and countries). For individuals, it's very easy to just put your cash in a checking account. Checking accounts are insured and non-volatile. But what happens when you're GE or Apple or Panama? You can't just flop a couple billion dollars in to a Chase checking account and call it a day. Although, you still need a safe place to store money that won't be terribly volatile. GE can buy a billion dollars of treasury bonds. Many companies need tremendous amounts of collateral on hand, amounts far in excess of the capacity of a checking account; those funds are stored in treasuries of some sort. Separately, a treasury bond is not a substitute investment for an S&P index fund. For individuals they are two totally different investments with totally different characteristics. The only reason an individual investor should compare the return of the S&P against the readily available yield of treasuries is to ensure the expected return of an equity investment can sufficiently pay for the additional risk. Those are the "right" yields. They are historically (but not "nonsensically") low. Those yields are reflective of the sluggish U.S. and global economic activity of the past decade. If global growth were higher, the yields would be higher. The period most nearly comparable to the past 10 years in U.S. and world history was the depressed 1930s.